When we speak, we speak using facial expressions, tones, and notes. Not only that, but we can sing! Our bodies are a perfect vessel for expressive language. On the contrary, when we write, we are limited in our expressions. Generally, the exclamation point is the most popular emotion we can type or write. But even that leaves too much room for interpretation. Too many times have I sent an email with far too many exclamation points in an attempt to sound like more than a robot, while the recipient might find me just plain…abrasive. (Thank god for emojis. I can’t wait until they’re considered professional enough for work emails. I like to think they’re the missing link to the lack of expression naturally built into written English.) But that's where expressive typography and hand lettering come in to play. For example, take the phrase “Let it Be.” Although this piece may not add anything obvious to the phrase, it adds a melody. Similar to how we might sing words to convey a feeling, the words “Let it be” here are illustrated in a symphony of loops and curls and colors to create an entirely different meaning to the viewer than just the words themselves. My artistic journey as a designer has gone through many phases. (I like to think of artists and designers as being in relationships with their current interests.) 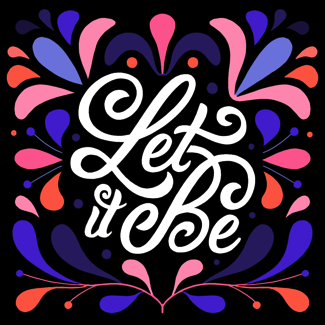 At the moment, my artistic love lies in the art of hand lettering and pieces such as this, “Let it Be.” I started my journey with painting and drawing in high school and several ARTS By The People workshops. In a graffiti workshop, I loved learning about all the fun and expressive ways to handle typography. That ABTP workshop that I took at 14 years old influenced my love of lettering to this day at 22. I love to call to experiences like that when I do my design work now. Here’s a picture of me at that workshop. Next time you see some cool graffiti or lettering, remember its creator is just a singer who is more comfortable working with their hands. I can’t paint. I am not an artist. This is the response I get very often when I teach senior art workshops. Many students are intimidated by the thought of creating something. They are also afraid of not being able to produce something good enough. I totally understand how they feel. I myself sometimes feel afraid when I am faced with a blank piece of paper. I try to remind them that everybody can be an artist. I suggest them to focus on the creative process itself – making lines with a pencil, adding colors, watching watercolors blend into each other, making marks with a brush, etc. It is ok to not produce something perfect. I believe there is beauty in everything we create. So I try to point out what they are doing great and provide encouragements. At first they didn’t believe in my compliments. They thought I was just saying it. Nonetheless, I kept doing my job – to find out what they are good at. It is a surprising experience to see that at some point they start to believe in my words AND themselves! Sylvia, a student who comes to my art workshop at Lester Senior Housing in Whippany, used to say that she cannot paint. After a few months, she stopped saying she couldn’t, and instead was proudly showing around her paintings to colleagues. Millie, another student at the workshop, also was hesitant to paint in the beginning. Now she is confident with her brush strokes. Every time we paint, she looks forward to showing it off to her grandchildren. It is a big joy to see my students learn to enjoy the process of creating. And it is a great reminder to myself too! It wasn’t until my first year of graduate school that I became familiar with literary journals. I had entered the MFA program at Emerson College after working in corporate marketing and had little knowledge of the publishing world in general. But there was a marketing position open at Ploughshares to which I applied and was hired for. In my time at Ploughshares, I went from being a novice about the literary magazine world to knowing its intricacies and quirks, its community and reputation. But the knowledge that I think will always stick with me from my time at Ploughshares is that literary journals are an enigma. They aren’t lucrative. They play to a very niche market. They are often run by a small staff of part-time employees or volunteers. And for whoever is producing them, they are a labor of love. Yet, despite all this–or maybe because all this–literary journals are one of the most unique and vital literary art forms. The work that appears in literary magazines is special because it’s not being guided by target audiences or profit margins. The pieces that make it to the pages of a literary journal were born, I believe, from a certain need. The type of need only an artist knows when they have an idea in their brain and won’t be satisfied until they’ve brought that idea to fruition. But the writing then makes another artistic transformation with the physical act of being included in a literary journal. In the same way that paintings or sculptures in a museum exhibit speak to one another, when a piece of writing appears in a literary journal it is seen in conversation with the words and themes that populate the rest of the issue. The voices of the contributors amplify each other. I could talk about literary journals forever (I won’t, don’t worry) because they hold such a special place in my heart–that’s why when I was asked to be the Editor-in-chief of The Platform Review (ARTS By The People’s very own literary journal) I was ecstatic. But, if I’m being honest, I was also a little nervous; literary journals are a special genre, and I knew that I needed to do them justice. But I feel fortunate that I have the ARTS By The People mission to calm my nerves. It’s an organization focused on encouraging artistic expression and building artistic communities. To me, those are two of the main pillars of a literary magazine. I’m looking forward to my journey ahead with The Platform Review, and I consider myself lucky to be the guiding hand that puts something as unique and important as a literary journal out into the world. I was first introduced to Paul Rabinowitz and ARTS By The People some years ago, when Paul approached myself and the Montclair State Dance Division Chair Lori Katterhenry about a possible collaboration between our dance program and the organization. We felt the best way to begin our partnership was to plan a visit to a senior center in NJ with Montclair State University dance majors. The goal for this visit was for students to perform choreographed solos and to improvise to poetry and prose written by seniors at the center. Lori and I were very excited about this new endeavor, so we invited four choreography students to take part. On the day we arrived, we were greeted with much appreciation and generosity, as all involved were ready and willing to explore this sharing of poetry and movement. The large room was set up with chairs in a u-shape formation so that the seniors could be close to the performers while they danced in the center of the room. For the first part of the sharing, the dancers performed their solos and the audience response was positive, enthusiastic, and engaging. Following the solos, the dancers improvised very sensitively to the poems and prose. Many of the seniors read their own writings aloud while dancers performed both gestural and abstract movements in response to the words. You could sense the electric, heartwarming energy throughout the room, which brought tears to a majority of the audience (including myself!). Needless to say, the outcome was both enlightening and emotional. The images that were evoked through poetry and movement were quite powerful and left a long lasting impression. One of our MSU dance students was so enthralled by the arts program for Senior Citizens, that she continued on by working at the center as an intern for Stories in Motion. It is an interesting coincidence that over the past few years, my exploration as an artist has revolved around a project with choreographer and poet Dagmar Spain called Poetry in Motion. Poetry in Motion explores the creative connection between the language of the body and the spoken and written word. This past year, I introduced Poetry in Motion to my Choreography III students at Montclair State University. In general, most dancers feel more comfortable speaking with their bodies as their primary creative voice, rather than speaking or writing poetry or prose. To my surprise, it was extremely encouraging and beautiful to see young choreography students write meaningful poetry instigated by movement, and visa versa. They truly found a way to express their poetic voices through both movement and words. As a choreographer myself, I find great value in being inspired by other art forms. Throughout my lifetime, I have collaborated with visual artists, composers, video artists, costume designers, set designers, and poets. The inventiveness and approach of these collaborative artists has always been a catalyst for my own innovation and artistry. So, when Paul Rabinowitz invited me to ask my students to participate in a project called Jump the Turnstile, I leaped at the opportunity. Jump The Turnstile is a collaboration in poetry, animation and choreography between students from Montclair State University, and students from MICA and CSE. Six of my former Choreography III students are currently participating in this project and at the moment, they are brainstorming with their poetry and animation collaborators. We are all looking forward to the culmination of this creative project in January 2019 What began as a small seed has turned into a wonderful relationship between ARTS By The People and Montclair State University. I’ve been writing poems for most of my life, but it took me until I was in my 40s, after a long and steady series of significant losses of varying kinds, to gather up the courage to take myself seriously and enroll in an MFA program in poetry. Just as my mentors and peers helped me to own calling myself poet, it was time to graduate and spring into the art world to seek out readings and publications. Rejections on both counts far outweigh acceptances for many of us, so the next leap was to create a trusting, supportive, community of poets who would be in it together. For about seven years now, we’ve been heading out together and on our own seeking publications, platforms…all sorts of places to share our work, to meet new writers, and to find motivation and inspiration to feed our creativity. A couple of people from my grad school community found ARTS By The People’s monthly reading series in Madison, NJ: The Platform. They told two friends, and so on until I found myself there a couple of years ago and strolled up to the stage to share a couple of poems from my soon-to-be-published collection. I felt right then that my poetry community was about to expand. That night, I was invited back to be a featured reader, and the next year, I was invited to be one of the four Platform hosts…an opportunity I plunged right into. Since community is central to my poetry, to the reason I create poems, to the arts and artists in general, I felt at home in this inviting, encouraging space where people of diverse ages and genders, class and cultural and life experiences come together to witness beauty and mystery and curiosity and the quest for understanding and connection. At The Platform, I was honored to get to know Paul Rabinowitz, the ABTP Executive Director who works tirelessly and generously to grow artistic communities. Each month we’d talk about writers and writing and ways that we both worked at creating collaborative experiences for writers with visual artists, dancers, choreographers, and musicians. When Paul talked with me a few months ago about working with him on a new project, Jump The Turnstile, I….well…I jumped at the chance! Over the last six weeks or so, 10 poets (half of them students) came together to record their pieces. These recordings were sent to abstract graphic artists, and to choreographers and dancers at two different higher education institutions. By the end of the year, our collaborative pieces will be complete, and we are working on the details of three live performances to happen soon after the new year. Keep your eyes and ears open for Jump The Turnstile and all the other innovative collaborations happening with ARTS By The People. Get involved by coming to events and supporting the community created here. Artists, as Van Halen sings, we roll with the punches to get to what’s real. We do this in our lives, in our art, and in our shared endeavors. We want to grow in community and in our art, we’ve got to go ahead and jump. I’m sure glad I did. Dance isn’t for everyone, or so you think! The arts, specifically dance, are an aspect typically neglected in many settings, such as public schools and senior facilities. Movement of any kind is a universal language that can be used as a form of communication. In fact, movement as a mode of expression and vocabulary is extremely valuable. Dance is an imperative art form for individuals of all ages. For example, students need to be provided with the opportunity to dive into dance starting from a young age due to the array of benefits it can have on a child’s education. Also, for adults, it is a fun, creative outlet that allows individuals to engage in a physical workout, that not only benefits their body, but also their mind. For seniors, dance strengthens interpersonal connections and gives them ownership of their own movements. Most importantly, through dance, individuals learn that they can have creative freedom, their ideas are valuable, and they can rely, trust and act upon their artistic choices. So, you’re probably thinking, if there are so many positive factors to dance, then why aren’t all populations being provided the opportunity to dance? Unfortunately, dance is typically neglected and is not the priority in communities. Dance educators experience many barriers, such as lack of support and money when advocating for the benefits of dance through exposure and education. In fact, dance is the first thing to get cut from schools, specifically public schools, when a budget is low. However, dance (as an art form and an education tool) is necessary and important. Kinesthetic learning allows people to work through memories and information by moving. It also introduces regular physical activity in a creative, fun manner, which helps to improve coordination and gross motor skills. People who move around, rather than sit stagnant at a desk, tend to absorb content better and faster. Through dance, people are able to learn about one another, connect with each other, and create community. Dance as an art form is vibrant, while also being inclusive, which makes it suitable for everyone of all ages. Anyone can be a dancer; it is not a selective league of individuals with a certain level of “talent” or “body image” or “physical capability.” Dancing includes everything, even everyday movements such as fidgeting in a chair or walking up steps. It is empowering for people of all ages to be informed and truly take part in dance. I am honored to be involved with ARTS By The People because they strive to make the arts accessible to the community. I am dedicated to my craft of dance and to bring it to as many people as possible. People of all ages, backgrounds, and socioeconomic statuses should be provided with the opportunity to learn movement as a form of expression. The most important message I’d love to spread is that dance is for everyone! Allow me to introduce myself: my name is Helen Krebs and I recently moved to a senior housing community in Whippany, NJ. My days are filled with the various activities available to the residents. My favorite class is the ARTS By The People writing class. Under the guidance and leadership of Paul Rabinowitz, I am able to put down on paper the many memories I have of my past. I enjoy writing for several reasons. The first is probably the fact that as a young girl, I was very shy and had very little self esteem. The only way I could express myself was when I would write in my diary – which I did every day. In addition, my favorite subject in school was English. In those days, we were taught how to write an essay in which the topic was broken down into paragraphs, where there was a beginning, a middle and an end, in order to help the reader grasp its main points. And last, but not least, I found writing to be very therapeutic. Whenever I was going through a difficult time, I would take a pen paper and write down all of my frustrations. It probably took the place of a psychologist. Whether the above reasons have anything to do with why I enjoy writing, I don’t really know. I do know that it pleases me that my thoughts are not just in my mind but that they are written down on paper where they cannot be forgotten. I first heard about Moving Words from my roommate in college, who asked if I wanted to make some extra money doing some voiceover. Sounded pretty simple to me. Year one: a small practice room on campus, 5 or 6 people squished in with a piano and a laptop, first time really reading the poems out loud. I wasn’t entirely sure what the process was at that time. It wasn’t until later that I learned these poems would then be sent to animators in Israel who would marry the written and visual elements together– so cool! I saw the fruits of our labor a year later when I provided the videos with the live voice-over during their viewing. I filed it away as an interesting, one-time thing and moved on. Then I was asked to come back and do it again the year after. Year two: time to rehearse the poems and delve into their form and style, a fancy recording artist with fancier equipment, a basement-turned-studio. Moving Words for me started as a “side gig,” something to help me through the college bills. I didn’t really think of myself as anyone other than the deliverer of someone else’s words. But as we read through the poems during that second year, talking about their content, picking up tempo the second time around, playing with breath, I realized that I had the honor of adding another small piece to the evolving artwork. I have always been a performer– as a theatre major I acted and sang quite often– but recently I had fallen into the role of theatre technician and thought of myself as less of a creator and more of a facilitator. Additionally, poetry is not my strong suit. I wouldn’t trust my untested opinion to make any sort of comment on someone else’s writing. I have never been a good judge of “good” or “bad” writing. When I worked with Moving Words, none of that mattered. I became a voice in the room, regardless of my past experience. It was unexpected and I felt out of place at first. Sometimes what I said sparked a new outlet, sometimes it was discarded for someone else’s critique. Either way, I had become a part of this project and that is when I realized that everyone has a place when art is being created. You may feel insignificant or inexperienced, but you will find your niche and make your contribution, as long as you understand you should be there too. I am thankful to Moving Words for giving me, and undoubtedly so many others, such a rewarding experience. The process has been full of moving poets and colorful animators and I am excited to see this year’s results! ***On top of all this, I am not a writer– just another example of the ways ARTS by the People pushes individuals to step outside their comfort zone and try their hand at something new to discover the many different ways that art can be created in the community! Movement has always fascinated me. Not only for its aesthetic qualities, but most importantly for its unique ability to unite communities, create smiling faces and bring joy to movers, no matter their age, ability or current circumstance. Because of my fascination with movement’s ability to offer a powerful and positive impact, I was thrilled to begin teaching creative chair movement to a lovely group of senior students this year through ARTS by the People. Every week, this very dedicated group of students shows up with a positive attitude and a willingness to try new movements. We begin our practice seated in chairs arranged in a circle, introduce any newcomers to the group and check in with how everyone is doing that day. After we have taken a few minutes to share our day, we sit upright in our chair and take a few deep breaths. Often times a slight smile will accompany their deepened breathing, as they take a break from their day-to-day life and ease into their mindfulness practice. After we have taken some time to come together as a group, we begin to link our breath with movement, each movement resembling a mini-meditation. Sometimes a student will share a worry or concern at the beginning of class and by the end of the hour (after moving, stretching, breathing and laughing with friends) often the student will share feeling less weighed down by the concerns she was experiencing at the beginning of class. Creative movement also offers joyful moments. The group encourages each other when a student finds a movement challenging or when rights and lefts are mixed up, creating a positive space to enjoy each other’s company. And so this is the power of movement: Our focus offers the mind a break from the pace of our day and a chance to embrace the fun and freedom of movement. These are feelings that we all need to be happy and fulfilled. I am extremely fortunate to have the opportunity to share the gifts of creative movement with such a wonderful group of students. It’s really hard to get people interested in poetry. At least, that’s what I used to think. A few years ago, when the political and cultural climate in Israel was getting pretty heated, I felt that a lot of it was due to the thinning-out of the language we use – in the media, in politics, and even to describe personal emotions and experiences. When we stop using language creatively and thoughtfully, we eventually also dilute our thoughts, our feelings, and our capacity to comprehend complexity. It is as if we are slowly becoming colour-blind, and stop noticing the gentle hues that surround us. Reading poetry, making it part of our lives, can help us find all those ‘colours’ again. And so, I tried looking for ways to get poetry through to more people and to younger audiences. But poetry is often perceived as quite ‘scary’ – it is complex and lengthy, and so it is sometimes harder for people to connect to the medium. But when poetry is served in new forms, it can find its way back into people’s hearts and minds. For example, over the past 6 years, spoken word has become increasingly popular in Israel – Poetry Slam events were PACKED with young audiences who wanted to listen, understand, learn-by-heart, and connect. When I listened to the spoken-word poem ‘Common Room’ by UK artist Talia Randall (who happens to be my cousin), which speaks about the loneliness and seclusion that many experience as adolescents, I knew that it needed to be shared. Along with 12 other Israeli animators, we created a short animated film that accompanies the poem, depicting our own feelings and experiences which were evoked by the text. The film was quite successful, and got loads of responses from youths around the world. That’s when we got it. We realized we had the tools to make poetry enjoyable and draw new readers. Only this time, the readers were also viewers. As poetry filmmaker Erica Goss said, “The future of poetry is in poetry films […] in order to bring poetry to young people we have to put it where they’re watching. Their eyes are already on the screen – put poetry there! They deserve it too…”. Working on poetry film projects with ARTS By The People has pushed this concept beyond my wildest dreams! This collaboration started with ‘Time’, a project in which poetry, animation and dance were brought together in a mixed-media performance, and continued through to international collaborations in which Israel design and animation students produce short films based on ABTP’s writers, like Revolving Doors and Moving Words (which is now in it second round). And just to emphasize the importance of this last project – it means that for the past two years, dozens of poetry films were created in Israel (29 in 2017, and 12 in 2018), by art students who then fall in love with the concept, and carry on working with poetry after graduation! I thought it was really hard to get people into poetry. Working with ABTP has made it easy. This past week, thanks to Arts By the People and Morristown High School, I led two creative writing classes in a workshop where we discussed finding inspiration from non-traditional forms. We started out by listening to some blues music, then we talked about working within the tradition of a given form, but then escaping that form in interesting ways through play and improvisation. Sometimes this can break us out of a creative rut and lead to new kinds of creative expression! We also talked about the practicalities of writing and I shared with them some resources that I hope will serve them well in the coming years. It was a joy and an inspiration to work with the students, who were all very bright and creative. I encouraged them to not be afraid to express themselves through writing and to submit to journals, especially the Morristown High School’s own Tricorn Literary Magazine and ABTP’s The Platform Literary Magazine. It was an honor and a privilege to be able to lead these workshops and I hope to do more in the future! Thank you very much to Morristown HS English Department staff Jennifer Furphey and Brian Kievning for having me and Arts By the People visit the classroom! Moving Words is an international projects that brings together writers, voice actors and animators to create short films. The project made possible by a generous grant from The Santiago Abut Foundation, in loving memory of Santi Abut. The Moving Words 2018 project has just passed an important milestone: The voice recording are now in the hands of the animators! I’d like to describe the process and all the work that goes into a project like Moving Words, but first – for those of you who are not familiar with Moving Words – I encourage you to view some of the finished works from Moving Words 2017. For the 2018 project, my involvement started when I saw the open call for submissions last spring and submitted my piece – then titled, “A Different Pair of Opposites.” I did not write this piece with Moving Words in mind, but selected it because of the length (the requirement was that it could be read comfortably in two to three minutes) and the visuals I tried to evoke in the writing. In August, I received word that it had been accepted. In September and October, I participated in several workshops run by poet David Crews (davidcrewspoetry.com). The workshop brought together several other writers in person – including Priscilla Orr, Paul Genega and Caroline Abut – and several more from around the country that participated via Skype. We focused on ways to make our written pieces more visual. We read several poems and discussed how they might and might not lend themselves to an animated piece. To be honest, this rewrite was one the hardest things I have ever done as a writer. The piece is largely about my relationship with my son. I wrote the original piece because I was trying to describe some difficult feelings, to plumb the depths and come up with something that felt real. I was satisfied with that work, glad to have done that work. But done. Finished. Then I had to go back in. Once final, the written pieces were then recorded (see David Olimpio’s blog post on the Recording Session). Some of the pieces were read by the author and some by a voice actor. I decided to read my own piece, so I met with the crew in the ad hoc recording studio to get the piece on tape (tape being an obsolete term, but I’m an old man, so forgive me). And then the recordings were on their way to Israel! Now, the animators get involved. Students from two schools in Israel, Holon Institute of Technology (will animate 8) and SHENKAR(will animate 4) are currently listening to the recordings and being assigned the piece they will animate. Over the next few weeks, they will work on concepts. We will have an opportunity to start a dialogue between writers and animators to ask and answer questions next month. In the end, the animators will have freedom to interpret the piece and create a finished animation using their creativity to bring these stories to life. I can’t wait to “meet” the animator that is working on my piece, and am even more excited to see the finished animation late this summer. Our plan is to have a US premier where all twelve movies will be shows sometime in September. And after the US premier, the movies will have a life of their own. This has been an exciting and rewarding project so far, and we still have a lot to do. Keep a look out for announcements about Moving Words 2018. The rooftop garden is comprised of four worn and neglected raised beds. The view from the fifth floor of the 19th century respite home for seniors and clergy is expansive, interrupted only by spires and a nearby steeple. On this day, rolling green hills and vast stretches of grey skies ring the railings of the garden in the sky. The weight of wet soil added to a trowel in a wrist is an old, familiar habit but now a challenge. A rotation of the arm to shift the soil, from the handheld trowel to the edge of the hole, for what is to be planted is motivating. This triggers the muscle memory of grown gardens, picked flowers and harvested fruits of past decades. As they dig, memories engage the gardeners, for that is who they are. A sense of self and purpose fills the hour as the clouds get darker. A comment on the color of the flowers to be planted is a pause of note that says “I am present.” A reach to feel how wet the soil is to the touch provides a momentary calculation of what the garden needs and a respite from needs of self. A glance upwards to the sky, as the sounds of the church bells toll, is assessed as imminent rain. The suggestion of ending the planting session because of cold and wind brings the 96 year old participant to ask, “Are you worried I will get sick? Get a cold perhaps? Who cares, I am terminal.” Her eyes sparkle as she laughs and coughs. She takes deep breaths as she shuffles indoors to retrieve a rain jacket. She returns in a fur coat. Glancing at the trays of unplanted annuals, she puts her hand out to feel the drizzle. “ Well let’s get this done,” she says, as she wipes her bloody nose once more, embarrassed at the public display of what ails her. She has lived beyond all the doctor’s expectations. She will not quit. It is she who keeps us going on that rooftop, to plant a garden, that none of us believe she will ever see in bloom. The ARTS By The People’s Floral Arts program reaches more than 120 seniors a month. The Therapeutic Horticulture sessions offer opportunities to engage and challenge participants through nature-based educational and sensory table top activities. Programs are held on a weekly, bi-monthly or monthly basis at numerous senior centers for participants in independent and assisted living, as well as closed Memory Care Units. Modified outdoor gardening opportunities are included and are site specific. Megan worked in Special Education and holds a certificate in Horticultural Therapy from New York Botanical Gardens. She is a certified Master Gardener and a board member of the Mid-Atlantic Horticultural Therapy Network. Before I start my post proper, I am very excited to be kicking off the ABTP blog. It’s an honor to be a part of this project, and I can’t wait to see where it goes! Something that has interested me for quite some time now is the common stereotypes surrounding the idea of “the artist.” As someone who has spent many sleepless night analyzing texts for midterm papers, I often find myself picking apart language in my everyday life (a blessing/curse shared by all former and current English majors), and this case is no different. The word “artist” tends to conjure very specific images in most minds. The more modern interpretations often evoke glimpses of life in a Brooklyn loft, ultra secretive gallery openings that require some sort of password to attend, and an existence dedicated to unlocking the mysteries of the universe through the act of creation. All too often, I remembered the words of my classmates and professors, who scoffed at anyone who dared to make work for commercial reasons, or take up a job under the thumb of “The Man” to support their art on the side. The term “selling out” became synonymous with complete artistic decay, and was a fate worse than death. Art was beyond money or any other physical object (though, this excuse certainly wouldn’t pay the rent). If one was to be serious about art, it should consume every fiber of their being. It was for this reason that, for the longest time, I never really considered myself an “artist.” Yes, I dedicated quite a bit of time to learning about the arts and exploring different forms of artistic expression, but I never felt like I truly met the requirements to be awarded the title of “artist.” I always got hung up on the details: how much time I spent working on my art (never), how often I attended big art shows (also never), and the fact that most of my work was not done for arts’ sake, but usually as an ends to a means, whether it be for an assignment or a job. I also didn’t belong to any sort of artist’s collective, as many of my peers were not interested in the arts. It was just me and my camera against the world. At a certain point, I felt as though I could not see the bigger picture. I could not see the forest through the trees. “The artist” became somewhat of a mythical figure to me. This view of mine was shaken when I began interning with ARTS By The People back in May of 2017. I was fresh out of college, and found myself tumbling out into the real world. I still did not know what I wanted to do with my life, or the role art would have in the grand scheme of it all. Through working with ARTS By The People, I had been introduced to large community of people that worked in a variety of artistic media. Finally, more art-minded people to talk to! But the thing that immediately drew me into this new group was the fact that it was not nearly as cutthroat as the archetype had led me to believe. It didn’t matter who churned out the most work, or who was the best in their respective field, or who showed the most devotion to the arts. What truly mattered was their willingness to improve and collaborate with others. I also learned that it was ok to have a life outside of art, as just with anything, it can be dangerous to let one aspect of your life consume you. To say that there is only one way to be an artist does a huge disservice to the whole community. Whether one lives off of their art, or can only devote a few hours here and there, they are driven by a similar urge to create, and that drive is the true mark of an artist. On a cold morning in December, some poets, voice actors, and one of the best live-audio-recording professionals in the business got together in a basement in Northern New Jersey and recorded some tracks for the upcoming Moving Words 2018 animations.